Our Spray Bottles and Bottle Triggers are superior quality. We have the "Toughest Triggers in the Industry". Viton seals protect triggers from the ravages of strong chemicals. Heavy-duty plastics outlast competitor's applicator bottles. We carry a full line, from the smallest 8 oz. 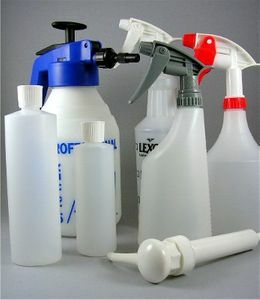 bottle to large, stainless steel sprayers. Yes indeed, you can count on Top of the Line Accessories to perform just like our larger tools.